As part of an international partnership that began two-plus years ago, Neag School Dean Gladis Kersaint and Yuhang Rong, UConn’s associate vice president for global affairs, traveled this past fall to the Middle East on behalf of the University to connect with educators, administrators, students, and even royalty, in a country where one Neag School program has been making an impact. 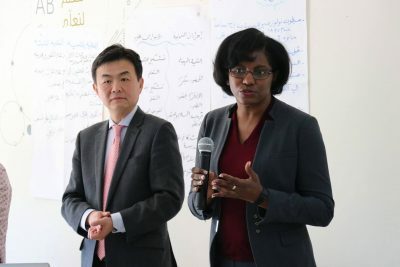 Since 2016, the Neag School has partnered with Queen Rania Teacher Academy (QRTA) in Jordan, in collaboration with the Jordanian Ministry of Education, to offer a program designed to advance the leadership skills of Jordan’s public school principals. Known at the Academy as the Advanced Instructional Leadership Training Diploma, the program is based on the UConn Administrator Principal Preparation Program (UCAPP). Originally conceived of by UCAPP program advisor Diane Ullman and QRTA advising consultant Mary Tardos, the training program is based in large part on research demonstrating that high-quality, school-level leadership is a key factor in creating a healthy school environment for students, teachers, and parents, as well as in raising student achievement. 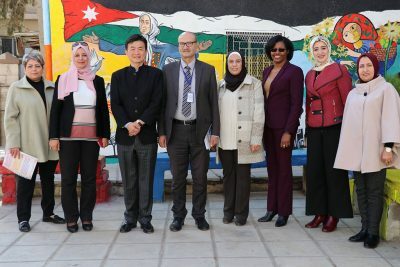 With program funding that had been secured from Global Affairs Canada for the past several years by QRTA CEO Haif Bannayan, a total of 350 Jordanian public school principals will have completed the training. The program, Ullman points out, is twofold — focused on training principals, but also on developing a cadre of instructors who will take over the program once the grant has ended — and so some of those trainees who graduated have since gone on to become trainers for future students in the program. A true global collaboration from the start, several Connecticut superintendents have also been involved in the program as adjunct professors, including alumni Kelly Lyman ’88 MA, ’01 6th Year, ’10 ELP, superintendent of Mansfield (Conn.) Public Schools; Howard Thiery ’08 ELP, superintendent of Regional School District 17 (Haddam-Killingworth, Conn.); and alum Paul Freeman ’07 ELP, ’09 Ed.D., superintendent of Guilford (Conn.) Public Schools. Meanwhile, Jennie Weiner, associate professor in the Neag School, has been working alongside QRTA’s research department to carry out a formal evaluation of the program. QRTA hosted Kersaint and Rong in mid-November for three days, during which they had the opportunity to meet with program instructors at the Academy, attend a workshop for its Advanced Leadership program, and join a focus group discussion about the impact of the program on participating schools. In addition, they visited Queen Zain Al-Sharaf School in Amman to witness the program’s outcomes on the school and its students, and had the opportunity to meet Her Majesty Queen Rania Al Abdullah of Jordan. With the program’s current cycle of funding having come to an end this past fall, QRTA was eager to continue the program and recently secured additional funding from the Jack Ma Foundation, an education philanthropy organization created by cofounder and former CEO of e-commerce and technology conglomerate Alibaba. The funding will support another program cohort. Last month, Her Majesty Queen Rania met with QRTA’s 2018 graduates, including 69 principals from across Jordan who had completed the Advanced Instructional Leadership Training Diploma, as well as 141 other school principals who are currently in the program. “Hopefully, the graduates of this academy will continue to pioneer the way to raise education to the standard our children deserve,” she said. View a photo gallery of the visit.